When it comes to the masterful Japanese director Yasujiro Ozu (1903-1963), images of gangsters, firearms and tantalizing molls don't normally come to mind. Early on in his career, however, Ozu did do a few gangster movies at the legendary Shochiku studio. While the films collected on Criterion's Eclipse Series 42: Silent Ozu - Three Crime Dramas brazenly copied Hollywood's Pre-Code output, mostly they represent Ozu melding the subdued elegance and emotional depth that were his trademark to this gritty genre. 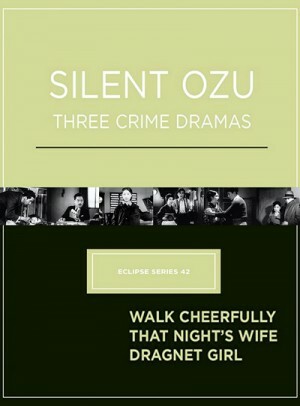 Like the rest of Ozu's output, these silent-era films hold a fascination for the director's ease with intimate, emotionally resonant drama and confident, fluid camera work (no surprise that, like Chaplin, Ozu held off from doing talkies for as long as he possibly could). All three contain some surprisingly showy camerawork, with amusing nods to Western culture such as the Hollywood movie posters decorating the sets. They ultimately end up sharing more in common with Tokyo Story and Late Spring than with Little Caesar and The Public Enemy, however - quiet dramas of people coming to terms with a changing world. Walk Cheerfully (1930) mixes the gangster drama with character comedy in the story of a hood named Ken the Knife (Minoru Takada) who vows to go straight when he falls in love with a “good” girl. His old girlfriend, who sports a Louise Brooks bob, isn’t happy about being dumped and decides to get revenge on them both. More somber is That Night's Wife (1930), which opens on the robbery of an office building by a lone gunman (Tokihiko Okada), a marvelous scene that is a model of crime movie direction, before revealing that the thief is no career criminal but a desperate father whose daughter is on the verge of death. The money is for the medicine that may save her life. Most of the film takes place in the one-room family home as the father and mother stand vigil over their young daughter, holding a cop hostage as they wait for her recovery. Dragnet Girl (1933) is the most flamboyant of the three, a redemption tale not of the gangster (Joji Oka) but his moll Tokiko (Kinuyo Tanaka), who has a civilian job by day and plays in the criminal underworld by night. When her boyfriend is smitten by the good girl sister of a young boxer, she ends up befriending the girl and deciding to go straight herself. Except that he wants her to pull one last job. Thank you so much for this. Any chance you can upload An Autumn Afternoon if you have it? Thanks again. Super. Thank you so much for all your effort and time.